The four Olympic swimmers who apparently concocted a story that they had been robbed at gunpoint made the claim to avoid “their moms finding out” that they had broken a petrol station door and exchanged their medals for magic beans, according to new evidence. American athletes Gunnar Bentz, Jack Conger, James Feigen and Ryan Lochte hit the headlines earlier this week when they said they had been accosted by “older boys” in Rio who stole their gold medals and were “really mean and had a big dog”. But video evidence has since emerged that appears to contradict the Olympians’ story, where Lochte can be seen confusedly walking head first into a door repeatedly until it splinters while loudly proclaiming “I gotta poo poo”. Further CCTV footage also shows the four men returning to the Olympic village after the alleged robbery, where they laugh as Conger mimics flatulence by blowing raspberries on his forearm, suggesting they weren’t “traumatised” like they’d initially said. And now an inside source within the village, codenamed Captain Airhorn, has released secret audio recordings that appear to capture the four swimmers conspiring to conceal their actions on Sunday morning, including a discussion of what they’d tell the police and media. The swimmers’ detention has prompted the need for translators who can speak fluent English, Portugese and Lochtese. The revelation could prove to be the final nail in their coffin-shaped charade and heighten the seriousness of their predicament, with Bentz, Conger and Feigen having had their passports confiscated ahead of likely criminal charges, while Lochte smuggled himself back in the United States by posing as a shaved lemur en route to a Nebraska zoo. Suspicions that their story may have been fabricated first surfaced earlier this week when the swimmers changed their account of events, with Bentz recanting on his claim that the thieves were “eight foot tall and green” and Lochte admitting that a gun hadn’t been pointed at him despite initially saying he had been shot but the bullet” bounced off” him and “hit Hitler’s son”. 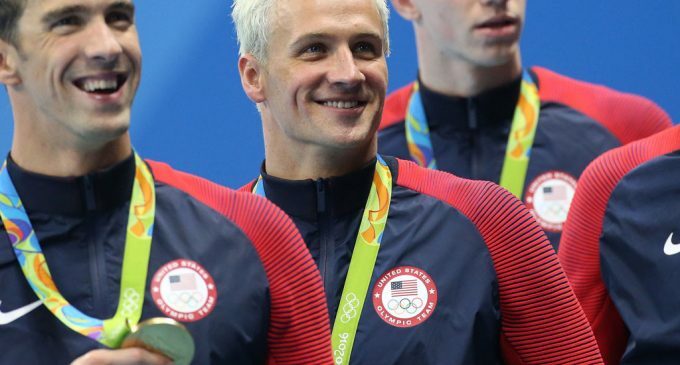 USOC spokesman Patrick Sandusky has said that Bentz, Conger and Feigen were co-operating with the police’s investigation, while assuring the press that Lochte would return to Rio once sufficient assurances would be given that he wouldn’t be grounded and his father “wouldn’t poop on him” if he told the truth.